Wanting to shed the image of an exclusive community, the country’s comic artists are holding an exhibition in a South Jakarta mall, to showcase their work to the public. The Indonesia Comic Community (MKI) together with the Bellezza Shopping Arcade in South Jakarta have organized “Comic Days”, a week-long comic exhibition with workshops and discussions. “We want not only comic artists and comic fans to come, but also the general public,” head of the the MKI, Rizqy R. Mosmarth said Sunday. Indonesia’s comic art scene is not as commercially successful at home compared to the numerous Japanese manga comics in bookstores. 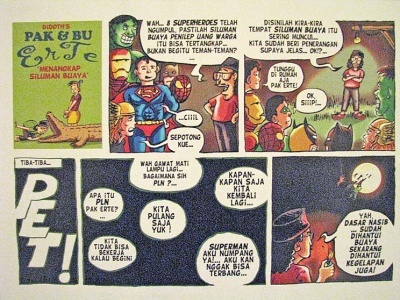 After its heyday in the 1970s, Indonesian comic art, with titles such as Si Buta dari Gua Hantu (The Blind from the Ghost Cave), went into hiatus. Independent comic artists and studios attempted to revive the scene in the early 1990s when comic artist groups such as Komik Nusantara, Animik and Apotik Komik started to emerge. Now, numerous independent comic artists and studios produce comic books. Rizqy said that through the exhibition, they wanted to reach a wider audience. Comic artists such as Ahmad Thoriq and Anto Motul — founders of the MKI — as well as Tita Larasati are taking part in the exhibition and workshops. Bellezza Shopping Arcade spokesperson Audrey Aristanty said that organizers would change the display of the comics daily during the event. At Sunday’s exhibition, social criticism was abound in most of the comics displayed. The graphic diary of Tita Larasati on display portrayed people on the street calling out “bule” (foreigner) to children walking with a lady. After they entered a public van, the boy asked the lady what “bule” meant and whether it was a bad thing. “It’s the only way they know how to treat difference,” the lady answered the little boy. Another comic on display was Studio Paragraph’s Bondan, Undul and Lila: The death of coral reefs. The characters were two children, Bondan and Lila, who were able to swim underwater without equipment after a fish, Undul, gave them special necklaces. The comic touches on issues such as environmental degradation and poverty. Rizqy said the studio had created the comic for an organization that works in conservation, the Terangi Foundation. One beautiful work that was displayed was Azisa Noor’s comic, which is a modern interpretation of the wayang story Rama and Shinta. Rizqi said that they would hold a workshop on Jan. 23.